Thanks a lot for so many comments that I received for my birthday and the anniversary blog. I could only say "I Love You All!" ... your comments are really a big gift for me and I feel really happy to receive them. And please check on my blog to find out who's the 2 lucky winners for giveaway on August, 1. Today, I only made snack bento and I used my new bento box from Bento & Co. This round box is 2 tiers box but I just used 1 tier because I only prepared for snack bento, so no need to put too much food inside. This bento was very simple and very quick to prepare. It just simply put everything inside the box. To get the orange rice balls, I mixed rice with tomato sauce and used cling wrap to mold it with hand to get the smooth rice balls. 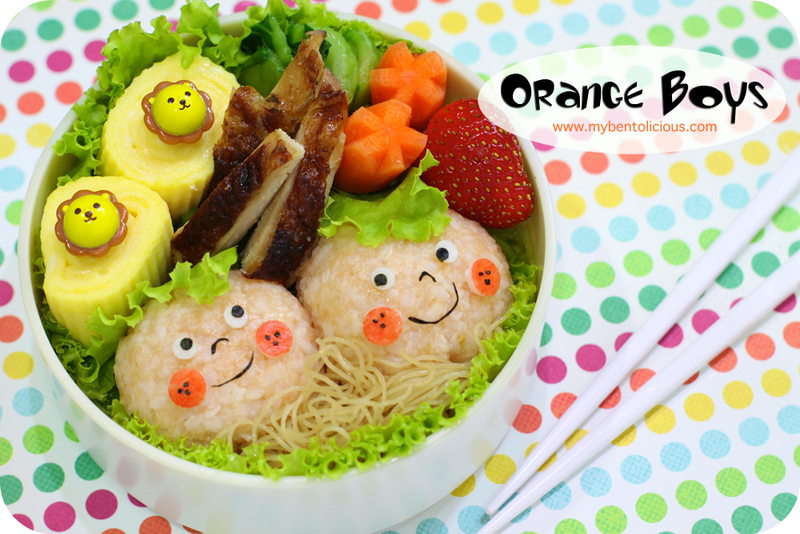 Inside the box : Orange rice balls, vermicelli, tamagoyaki, roast chicken, sauteed pok choy, baby carrots, and strawberry. Am I the first one here? So I can share to eat this beautiful bento too. @Anncoo : hahaha ... You have to ask Tata first ;) Thanks a lot Ann! love those orange boys, one is looking at the photographer (you) and the other looking at me! hehe..
these orange boys are sweet and adorable, and your tamagoyaki rolls are perfection, don't know how you do it lia!! Lia! These orange boys are really wonderful. I love the picks in the tamagoyaki... in fact, I just bought a set of these picks in San Francisco yesterday! Have a wonderful week! n for tamagoyaki, how did u make it? No matter how simple they still looked awesome! your skills are good in making the boys carry different expressions. very cute! As always, stunning colors on your bento. It's just so great of you, being able to pack this heavy bento and also so beautifully in the rush morning hours. Thumbs up!